Escrito por Ted Lewis, Director del programa México de Global Exchange, y publicado en Huffington Post. Last June, I traveled to Honduras to confer with civil society leaders about organizing a five-nation, “end the drug war” caravan — all the way from Central America to New York City. The “caravan” aims to stir debate in places profoundly damaged by the drug war and to bring people and their stories from those regions along the route to New York City just prior to the convening of the United Nations General Assembly Special Session on Drug Policy (UNGASS) next April. We knew this trip was guaranteed to be challenging. Honduras has been hit very hard by the drug war. The dramatic profits available to those who traffic in prohibited drugs have fueled the growth of criminal organizations, spurred violence, underwritten pervasive corruption, and bolstered the institutionalized impunity that enables all of it. 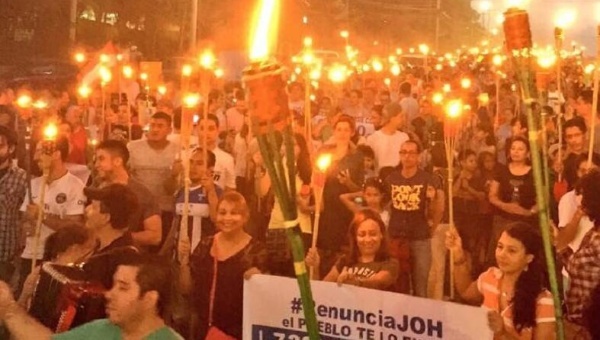 But there was a big, hopeful surprise awaiting us in Honduras: the stunning emergence of a powerful civil revolt against government corruption that took to the streets while we were there, and that has been calling for the President’s resignation ever since. As I was preparing to travel I had read of allegations that funds were pilfered from thecountry’s social security and health system. This seemed really bad, but I was so focused on travel details and our safety that I failed to understand the depth of discontent that this would unleash. We were, after all, mapping out an itinerary that included San Pedro Sula — currently one of the world’s most violent cities. From there we’d head to a community meeting with Garifuna leaders, seven hours (and hundreds of kilometers east of my comfort zone) in the sweltering, mafia-dominated lowlands near the Caribbean coast. On reflection, it’s not really surprising that discontent has boiled over in Honduras.Extreme poverty is widespread and just a few oligarchs control most of the country’s lands and wealth. 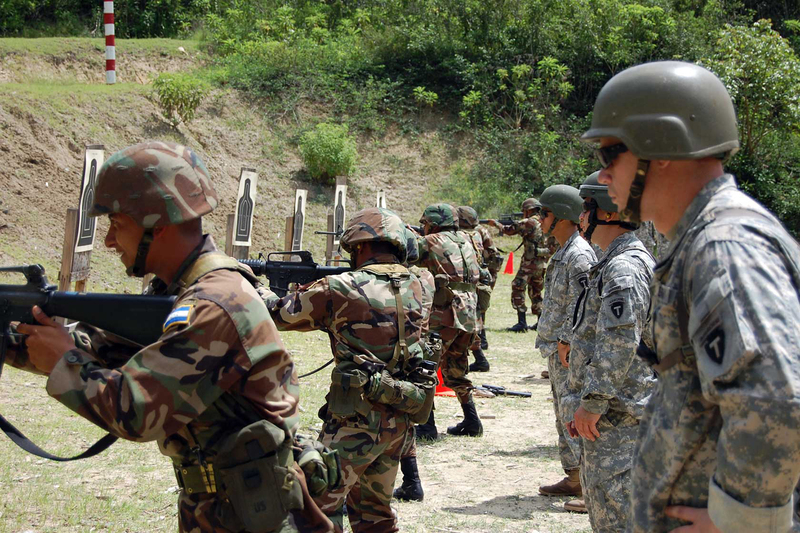 Decades of a heavy U.S. military footprint in the country — and more recently, Hillary Clinton’s back-channel support of a 2009 military coup — have encouraged the enemies of democracy in Honduras. Since the 2009 coup, gang violence has surged — adding to the economic pressures that prompt thousands of desperate families to emigrate, or sometimes even send their kids north alone, despite the terrible risks involved. But the trigger for this summer’s peaceful uprising was the revelation that hundreds of millions of dollars were stolen from the national health system, much of it channeled directly to ruling party political campaigns. Thousands of Hondurans died needlessly due to shortages of medical personnel and medicines. These are the facts behind the outrage that has propelled multitudes of discontented, torch-carrying citizens into the streets. As we traveled and spoke with organizations and leaders across Honduras we encountered deep opposition to the militarization and corruption of public life that have accompanied the drug war. We were especially interested in speaking with Garifuna and other indigenous leaderswho have been among the most outspoken critics of the drug war — even as they have confronted smugglers encroaching on their ancestral lands. The Garifuna are descendants of escaped African slaves and indigenous peoples who intermarried and settled along Central America’s Atlantic Coast in the 1700’s. They were once isolated, but in recent years have come under intense pressure from unscrupulous tourist development and sprawling African Palm plantations. 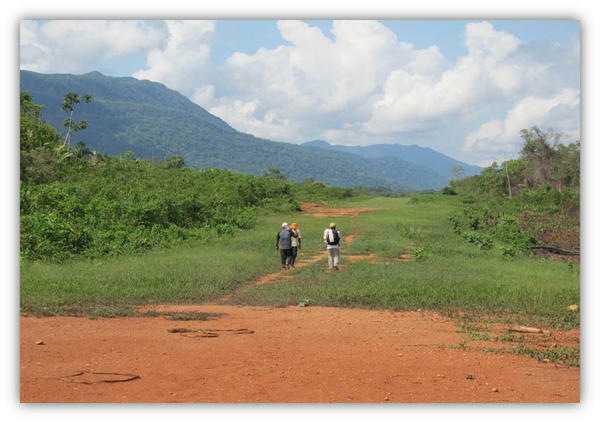 Last year, Garifuna in the tiny settlement of Vallecito found a drug-smuggling airstrip built and being operated on their territory. Miriam Miranda, leader of the Black Fraternal Organization of Honduras (OFRANEH) stepped in to document and protest the intrusion. OFRANEH pressured the government to shut down the airfield. 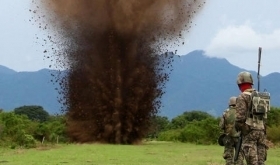 The army eventually complied, dynamiting large holes to disable the dirt runway. But that was not the end of the story. The smugglers returned and started filling the hole with logs and dirt. When OFRANEH leaders began to document the refurbishing of the airfield, they were seized at gunpoint by sicarios on motorcycles. They were released long hours later, but only because other members of their party had eluded the gunmen, alerted media, and triggered an international campaign for their freedom. Now, a year later, OFRANEH boldly maintains a permanent encampment on the site to keep traffickers away. This year, as protests were mounting across the country, OFRANEH held their national leadership meeting at the remote encampment. They invited us to come there to talk with them about working together to end the drug war. 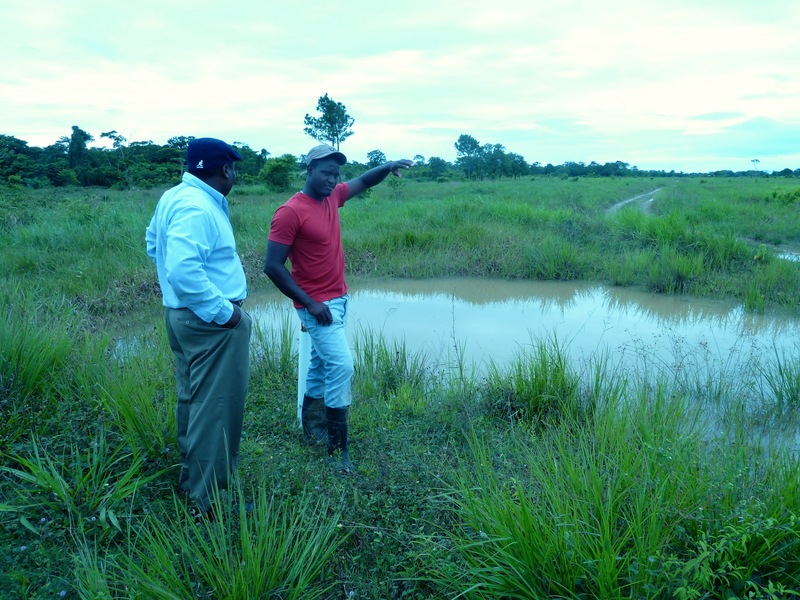 “Mimo”, who guided us into Vallecito on his motorcycle, points toward a baby crocodile in one of the water-filled craters dynamited into the airstrip. We agreed about a lot of things: The drug war is a disaster and it is past time to break the taboo on speaking honestly about its impact on people, families, communities, countries, and entire regions. They explained how parasitic criminal organizations that grew from the hyper-profits of the prohibited drug trade now run other enterprises, like extortion rackets and human trafficking. They launder ill-gotten funds through investments in mining, hotels, agriculture and other superficially legitimate industries. The OFRANEH leaders are interested in promoting an international discussion of how we could starve the beasts of the drug war through realistic regulation of drugs that aims to dramatically reduce the illegal trade. We talked about how human rights, public health, and harm reduction practices should be the guideposts of any new, reformed drug policies. But to be clear, no one thought ending the drug war or dismantling the powerful criminal organizations whose money and influence derives from it would be easy. Nor will it be easy for Hondurans to restore democracy and curb the power of the oligarchy. Open public debate and scrutiny is needed to reveal the truth about the drug war: it is a deadly, decades-long international mistake that cannot be solved by any country on its own. Pragmatic drug policy reforms require concerted international cooperation. Such reforms will not resolve all the deep tensions roiling Honduras and other countries, but freezing the drug war profit machine via incremental regulation of today’s illicit markets is a critical step toward reducing violence and weakening the networks of corruption and impunity that undermine democracy and deny justice. The morning I left Honduras I took a taxi from my hotel in San Pedro Sula to the airport. I was in the mood to chat and asked the taxi driver if he ever felt scared doing his job in this most violent of cities. He told me that, “Yes,” he was often afraid and that (pointing to a police car), “the worst part is that you can’t rely on the authorities for help because many of them were working with the criminals. Do you know about the war tax (impuestos de guerra)?” he asked. “Let me explain,” he said. “Every week we take our ‘contribution’ to the local jail. I am not joking,” he insisted. As he dropped me off to catch my flight I was still thinking over the nightmarish implications of what he’d told me. For people trapped in this criminal maelstrom there is really no way out. The enduring lesson of the 13 years of alcohol prohibition in the United States in the early 20th century is that, whether we approve or not, people will seek out mood-altering substances. We can regulate alcohol, but trying to eliminate it simply incentivized crime and fueled the growth of domestic mafias. In the early 1930s the U.S. ratified an amendment to the Constitution to rectify the mistake. Today, there is a growing consensus that the international war on drugs is a similar fool’s errand. The United Nations Special Session next year is a good forum to push this conversation ahead, but it will take a longer, concerted effort to democratically change minds, hearts, and policies. That’s why we will travel from Honduras to NYC next year. We invite you to join us, in-person, on-line, and around the world.